Occasionally in Barcelona you find cafés linked to cake shops, the better to cater to the insatiable Catalan sweet tooth. 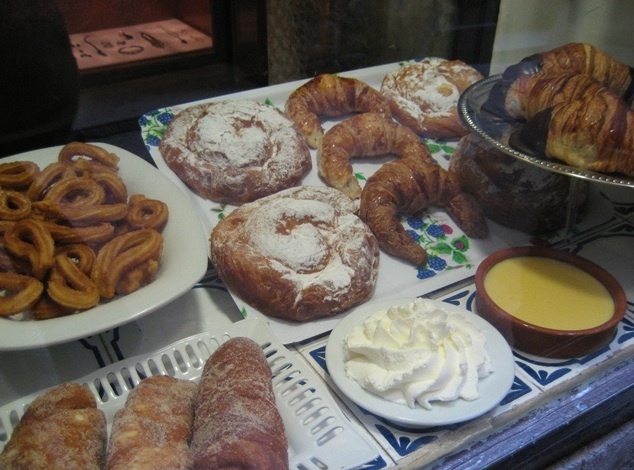 But for a real indulgence of all things creamy and sweet, head to a granjas, or dairy bar, an old institution for breakfast (they all do coffee and hot chocolate) as well a late-afternoon pick-me-up of pastries. At least once try the Catalan specially ensaïmadas, airy pastry spirals sprinkled with powdered sugar. Granja Viader is a classic. Another old-fashioned oddity is the Orxaterias or horchaterias, specializing in orxata (horchata in Castilian), a pale refreshing drink made of crushed tiger nuts, one of the nice things the Arabs left when they passed through in the 8th century. They usually sell snacks and cakes as well.